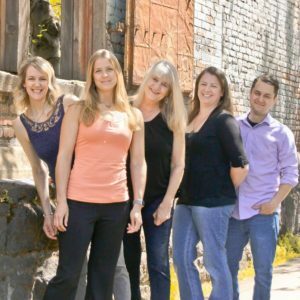 We are a Real Estate Company in Portland Oregon, who loves to hang out together, working and playing! I’ll give you a little bit of our history, so you can understand who we are, and how we work as a 3 generation team to help our clients have the best real estate experience we can give them! 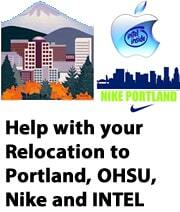 We are in love with Portland, and want to share our knowledge of real estate and Portland with our clients! In 1975 we bought our first house in a suburb of Seattle. It was a 1914 house, with lots of charm and character, but also many problems. It had knob and tube wiring and fuses, a kitchen that wasn’t really there, tiny rooms that needed to be opened up etc. We redid the house over a period of years, adding on to the main floor, adding on to the upstairs, opening up walls, building a 3 story fireplace with 2 flues out of brick (Yes we did it ourselves! ), redoing the wiring, put in a new kitchen, added a bathroom, built a huge shop in the garage and added a huge family room above it, plus many other things! We did the work ourselves, and by the time we were finished, it was beautiful! I learned what it takes to remodel an old house, the pitfalls, the problems, and the joys! We also built my parents a gorgeous house on Lake Tapps, which was a steep hill, doing all the work ourselves, the permitting, the foundation, the electrical, the plumbing and everything else! We also did other building and remodeling during those years, even building little store fronts in the Fred Meyer complex near us. During that time, we had 3 daughters. And as they grew, they worked right along with us, learning by doing and watching! We sold the house for a huge profit, and moved to Portland in 1993. 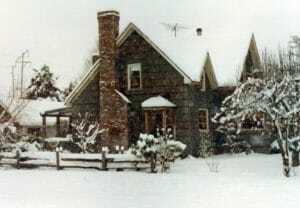 In 1993, we bought a 1970 4000SF fixer on Bull Mountain in Tigard. It needed everything! By then all my girls were able to help, so they worked right along with us in the remodeling. I also worked at Home Depot for almost 5 years in various departments, teaching all the Remodeling Classes at times, and even writing and teaching the Home Depot University Electrical Class which was 2 hours! I learned alot during those years, because, not only was I still remodeling my house, but I was working with experts, contractors, electricians etc at Home Depot. I always had lots of questions, and they were very patient in teaching me. That was our job, to not only understand all the intricacies of building and remodeling, but to be able to explain it to the customers! 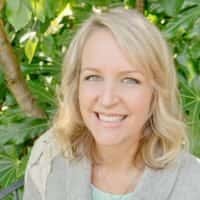 How Helen began her real estate career: In 1998 I decided to get my real estate license, and worked for some of the bigger companies, learning how to sell real estate. I realized that real estate was changing fast, and it didn’t make sense to me for us to do things the “Tried and true way” that realtors had been using for years. I had purchased my first house for $28,000 and the commission was 6% Now houses were averaging $250000 and the commission was still 6% That didn’t seem right. Realtors were still basically doing things the old way, which is to do open houses, advertise in the newspapers, etc. But things were changing. Everything was going digital- advertising, photography, maps, email…plus people were using cell phones and faxes. Things were getting easier for realtors, not harder. And prices were higher, not lower! I decided I wanted to list houses for 1.5% I worked for Coldwell Banker at the time, and they would not allow me to do that. 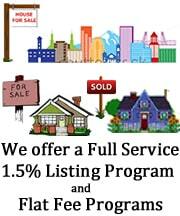 I found a Real Estate Company in Portland, Oregon First, and I became an agent for them, doing 1.5% full service listings. They taught me so much! They were sticklers for all the laws, rules, deadlines and other things realtors had to adhere to, and they taught their agents well at their weekly meetings. Their Principal Broker was also really good about making sure all the paperwork was done right, and if it wasn’t, she explained patiently what had to be changed. She made sure we knew and followed all the ethics and laws of real estate! I worked there almost 2 years, but the last year I was consistently their top selling agent, month after month. They were getting requests for other agents in their company to do 1.5% listings, but they wanted to keep the commission at 6%, so I was told I had to stop advertising 1.5% listings. I couldn’t do that. I really believed in what I was doing. I thought it was fair, and I didn’t want to change, so I decided I had to leave Oregon First and start my own company. Hayley, my youngest daughter, graduated high school when she was 18, and when I asked her what she wanted to do with her life, she answered, “Become a Realtor!” It was something I had never expected, never even dreamed of, but the best gift I could ever have! 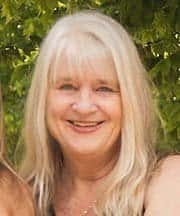 She had been going with me and helping me with things an unlicensed person was allow to do, for the past few months, and had fallen in love with real estate, just like I had. She got her license within 2 months, joined Oregon First for the last year I worked there, and together we designed and started a Real Estate Company in Portland in January of 2006! What we wanted for our Real Estate Company in Portland was to continue the Full service 1.5% Listings, add the option of Flat Fee listings, and become neighborhood specialists in all the neighborhoods of Portland. I had learned through my past work, that Portland was based on neighborhoods. Each neighborhood was unique and different, had it’s own personality and offered it’s own lifestyle We felt this was important to convey to our buyers. It was complicated, though, hard to explain in emails or just talking about it. 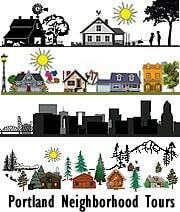 We felt that the best way we could help our buyers is if we wrote a comprehensive guide to all the neighborhoods and suburbs of Portland and put it out on our website! 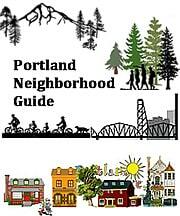 I had already done a partial guide, but we wanted to make it all inclusive, including, not only the neighborhoods of inner city Portland, but all the suburbs and countryside. It was a huge undertaking! During this time, 2006, my other two daughters joined our company. Wendy, my oldest daughter, had been teaching piano all over Portland, so knew Portland neighborhoods really well. She loved piano, but also loved houses and decorating and helping people! The perfect mix of becoming a good realtor. She joined us a few months later. Then Lisa, my middle daughter, had been a corporate travel agent. But when she got pregnant, she realized she wanted to have more time with her baby. She got her license and joined us also. You can read more about each of my daughters on their pages! In 2013, Lisa had another baby, Hazel. She decided to take a leave of absence for awhile, so she could enjoy raising Hazel. Lyle, Lisa’s husband decided to get his license and become part of our team. He adds an amazing dimension to our company, with lots of fresh new ideas, adding a whole new aspect to what we do. He is a young man, who loves electronics, and has grown up with all the new apps, understanding their importance and how they can add to our business. We have a lot of fun working together. We know that it is important to always be available to our clients but we don’t let that stop us from doing fun things together. 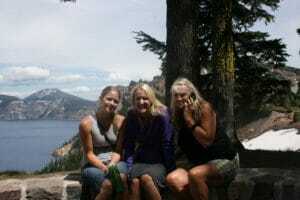 The picture on the right shows us at Crater Lake, hiking and having fun, with me on the phone dealing with a client! Notice we are all happy, we love to be together, and we love real estate!